Bus passengers across the UK have voted for their favourite bus journey in a survey to find Britain’s Most Scenic Bus Route. And the winner is the stunning 840 Coastliner from York to Whitby that crosses the North York Moors National Park. Over 15,000 votes were cast in an online poll of bus users, sponsored by Bus Users UK, to choose the country’s most captivating journey from a shortlist of more than 100 of the nation’s finest routes. Coastliner CEO Alex Hornby said: “I’m absolutely delighted that our Coastliner service is now officially Britain’s Most Scenic Bus Route – especially as the votes have come from the people whose views matter most of all to us, those who travel on our buses. “And the views are just part of the story – our Coastliner service has been transformed, with amazing new double-deckers offering a host of customer-friendly features, including superfast and free 4G Wi-Fi, USB at-seat power points, audible next stop announcements and comfortable coach seating. “This wonderful news is ideally timed, as the summer season begins – we’re looking forward to welcoming new customers to take a seat with us on the top deck, to enjoy the grandstand views of the Moors and coast”. The poll was the idea of bus enthusiast Paul Kirby from Wetherby, who was surprised that no one had carried out any research to discover the nation’s most scenic bus service. He then approached Britain’s leading bus operators – Arriva, First, Go Ahead, Stagecoach and Transdev - with the project. Paul said: “I was delighted that Britain’s leading bus operators supported the survey with so much enthusiasm, helping to make it such an outstanding success. The response in the first couple of weeks was incredible with over 1000 passengers visiting the site and voting for their favourites. It shows that many people greatly appreciate their bus services and our glorious British countryside, particularly those on our rugged and varied coastline. “Voters could choose from a shortlist of routes in England, Scotland & Wales or suggest their own. The three-month survey attracted nearly 16,000 votes at the final count with Coastliner’s imaginative promotion of the service helping to make it the well-deserved winner.” Paul Kirby presented the winner’s certificate to Coastliner’s General Manager Colin Booth at Whitby bus station, the eastern end of the 840 route. The top 3 most popular routes covered the whole of Britain; from the Highlands of Scotland to the South Coast of England. The runner up was the 914/915/916 Glasgow to Fort William to Skye via Loch Lomond and Glencoe service run by Scottish Citylink. The bronze position went to a Dorset coastal route, the Purbeck Breezer 50 from Bournemouth to Swanage via Sandbanks, Shell Bay and Studland. This service is run by morebus, part of the Go Ahead group. In Wales, the most popular route was the Arriva Buses Wales service 5/5C/X5 running between Caernarfon and Llandudno along the North Wales Coast. 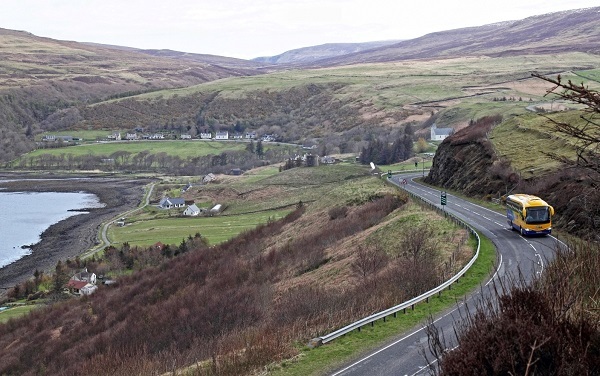 A website of ‘Britain’s Most Scenic Bus Routes’ will be produced later this summer, particularly aimed at visitors from abroad who are unfamiliar with our public transport system.